Our current apartment is close to perfect for our needs (see pics), so we we’re wondering how God is going to work out our permanent location. This temporary place has three large bedrooms, is fully furnished, and is in the old city, not too far from our teammates, the O’Byrnes. They even have a bunch of videos to keep us from getting too homesick and exercise equipment. The ceilings are really high, and the building has a lot of character, being well over a hundred years old. We have had very little success so far in even being able to look at other options. A search through the papers and online has gotten us nowhere. Most folk do things here the old fashioned way, by word of mouth. Trouble is, word has only found us one place, and it is for sale, but it is a very interesting option. This new possibility is a 3-bedroom place being vacated by much older missionaries who have been here since ’92 and are either leaving the city or the country – haven’t decided. Their heart is to bless another missionary couple by selling it below market value without the use of a Realtor to save fees, etc. We’re talking about $32,000 off the street value here. We had looked into buying an aparment several months back, but it didn’t go anywhere, and our current temporary option came up as a perfect solution that would allow Diana to be a part of the decision-making process when we got around to finding something permanent. So, what about this apartment for sale? 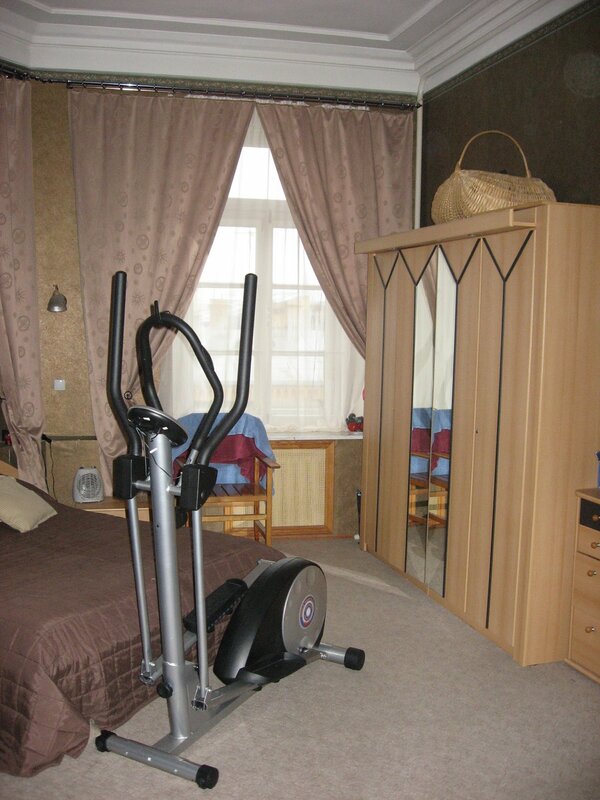 Pluses: The apartment is extremely well maintained and fixed up to nearly US standards. It looks very attractive inside, and all the furniture (very nice stuff) conveys. There are two balconies that can be used for plants, extra storage space, and/or fixed to be additional living space (like an office). The grounds are nice, and very large, with lots of grass and nice play equipment for the kids. This is almost unheard of here in the center of the city. Minuses: It’s not in the center, which is a bummer from the perspective of aesthetics. The buildings in the city center are SO cool. Those buildings out there look like the Soviet Union. It’s also further from our teammates, making community with them harder. Moreover, how are we going to pay for it? The price is almost what we sold our house in VA for, and loans are really tough to find here. (Our house in VA has yet to close, by the way.) Ideal would be a generous benefactor(s). Second best would be a group of folk who partner together to offer us a private loan. This has been done with some other missionaries, so I’m looking into this now. I welcome all comments and ideas. August 9th update: I called today to talk about buying the apartment, and it has already been claimed. The general impact on me has been a strengthening of my resolve to buy if the Lord will make it possible.